This week millions of children will take part in Hour of Code as part of Computer Science in Education Week. Teachers and librarians who are looking for books on the topic of computer science should pick up a copy of Ada's Ideas. 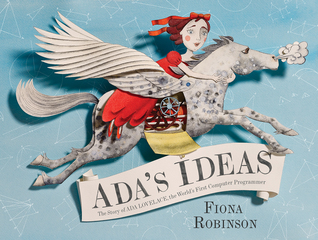 This picture book biography traces the life of Ada Lovelace, the first computer programmer. Lovelace, daughter of Lord Byron, grew up in the 19th century and had an excellent education and a proper upbringing thanks to her mother. Fiona Robinson shares the many influences in Lovelace's life including the creativity she in inherited from her father, the love of math that came from her mother, and her idea for loops and sequences in computer programming that Lovelace modeled after looms in factories she toured. Readers will appreciate the watercolor illustrations Robinson cut and mounted at different depths which make the illustrations appear 3D. Ada's Ideas could be read aloud to upper elementary students who are learning about loops and sequences in computer programming. Lovelace's work and life demonstrate to readers that computer science is a marriage between art and STEM.